The United Nations estimates that over 250,000 people are trapped in besieged areas of Syria. The majority of these areas are besieged by the Syrian regime, which has called it a "Starvation Until Submission Campaign." 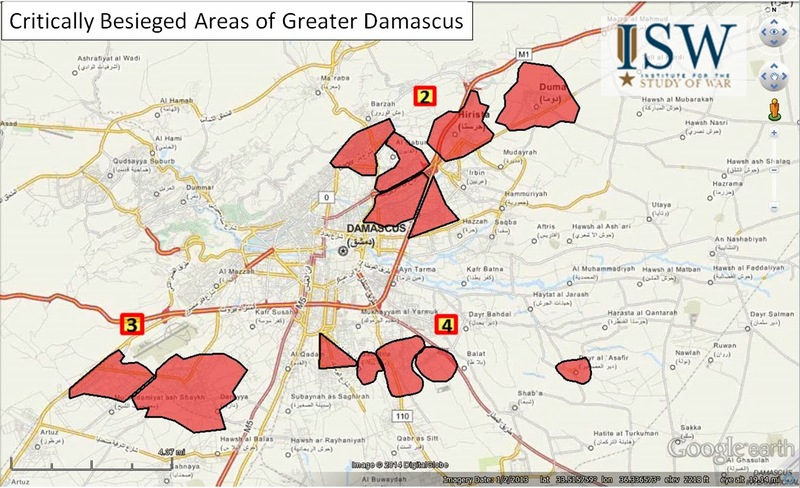 Currently, the most critical areas where civilians are at greatest risk of starvation are in and around Homs and Damascus as depicted in the maps below. There are indications that the Assad regime is trying to enact similar sieges in Aleppo as it uses barrel bombs to cut opposition supply routes. These sieges have played an increasingly important role in the regime's war strategy. On January 26, 2014 an Iraqi Army outpost was attacked in the Naimiyah area south of Fallujah city. The area contains a mini-dam called the Fallujah Dam. The attacks were successful, although the Iraqi government has not officially confirmed it, and resulted in the capture of at least nine Iraqi soldiers. The event represents a high-profile and well-documented operation for armed groups in Anbar as the crisis enters its second month. It also illustrates how militant groups other than the Islamic State of Iraq and al-Sham (ISIS, previously known as al-Qaeda in Iraq, or AQI) are participating in the fight. Different groups claimed responsibility for attacking the outpost and successfully defeating the Iraqi Security Forces (ISF). ISIS-leaning social media accounts posted a photo claiming the custody of nine soldiers who were later executedby the group. A video posted on YouTube earlier showed a number of ISF soldiers paraded by members of ISIS in Fallujah. The soldiers in the video appear to be the same ones who were executed. In addition to ISIS, a new force called Jaysh al-Adiyat or the Army of the Chargers also claimed to have attacked the outpost, posting a long high-quality video on YouTube. The name is a reference to a Quranic chapter by the same name. This is the first time the name Jaysh al-Adiyat has surfaced since the beginning of the Anbar crisis. It is unclear when exactly the Jaysh al-Adiyat was formed, but the first video of its formation was posted on January 28, 2014. 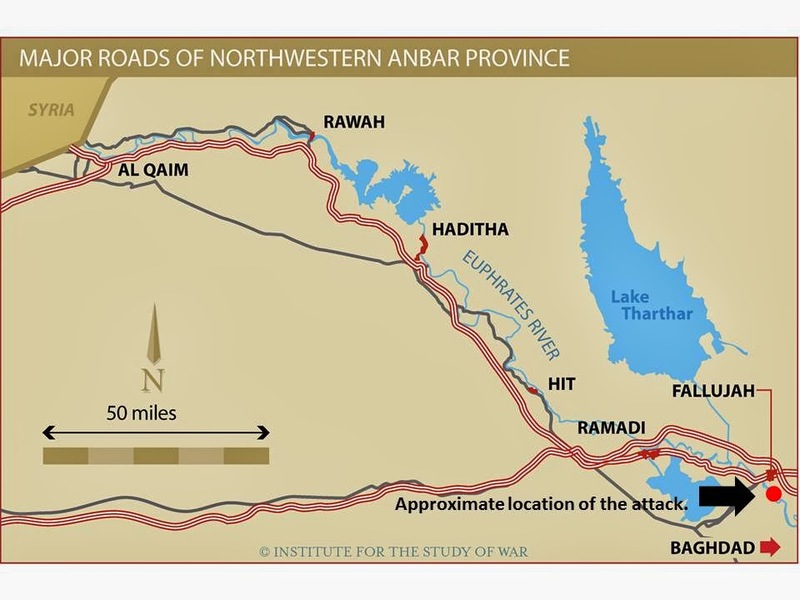 However, given that the group announced a prominent role in the operation in Fallujah dam, it is likely that it has been operating in Anbar prior to January 28. A group purporting to represent the Jaysh al-Adiyat announced on January 28 that it has been dismantled and joined the “Revolting Tribal Revolutionaries” a reference to the already-formed Tribal Military Councils (TMCs) that ISW has assessedto be a major front group for the Ba’athist group, Jaysh Rijal al-Tariqah al-Naqshabandia (JRTN). In announcing the dismantling, the masked speaker in the video stated that they are joining the TMC to “guarantee the unity of leadership, control, and coordination.” The speaker also announced that the Jaysh al-Adiyat will join forces with “revolting tribes” in Baghdad, Fallujah, and Garma near Fallujah. The quick announcement and then disbanding of the Jaysh al-Adiyat is likely intended by JRTN to portray an increased level of support for an anti-government military movement. The group’s usage of the pre-2003 Iraqi flag and announced support for the Tribal Military Council in its formation announcement indicate its Ba’athist roots. Furthermore, the group appealed to officers and personnel of the pre-2003 Iraqi Army who are the core members of JRTN. While the Ba’athist connections are clear and easy to establish, it is not possible to ascertain if the members of the Jaysh al-Adiyat are a reconstituted force of Fidayeen Saddam. Regardless, the highly-trained Fidayeen included Iraqi Sunni and Iraqi Shi‘a who likely joined respective Iraqi Sunni insurgency groups and Iraqi Shi‘a militias after 2003. The experience gained from service with these groups combined with their training before 2003 make the Fidayeen highly capable militarily and a potent force if they join a nascent insurgency movement. It is likely that both ISIS and the Jaysh al-Adiyat attacked the outpost. It is unclear, however, if they did so jointly or separately. There is no evidence that the Jaysh al-Adiyat captured any soldiers. The evidence suggests that ISIS had custody of the soldiers and executed them as the group has traditionally executed soldiers and civilians in the past. The attack on the dam was successful and videos of the operation demonstrate that the outpost was not well-fortified. The lack of formidable defenses facilitated the takeover of the outpost and the capturing of soldiers. It is also likely that the attack was successful due to the soldiers’ lack of knowledge of the area’s terrain. This is especially true for military units that have been deployedfrom southern Iraq to Anbar at the outset of the Anbar crisis. These vulnerable positions will likely be attacked again as the stalemate in Fallujah continues between the Iraqi military and the various armed groups in Fallujah who likely now control different parts of the city, with ISIS being more dominant. 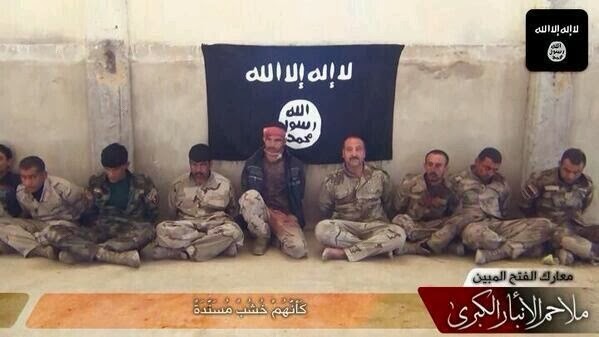 Looking ahead, Anbar will continue to be a space where anti-government forces will engage the military. Given the calls by both JRTN and ISIS for spreading the fight to Baghdad, it is critical to see if attacks expand in Baghdad and how the Iraqi government reacts. Ahmed Ali is a Senior Iraq Research and the Iraq Team Lead at the Institute for the Study of War and Omar Abdullah is a News Analyst at the Institute for the Study of War.